According to the American Veterinary Medical Foundation, 20-40% of dogs suffer from separation anxiety. Separation anxiety is one of the most common canine behavioral issues pet parents work through with their dogs. Punishment or shaming will do little to stop anxious dog behaviors in the long-run, because punishment does not address the source of the problem, which is the dog’s anxiety. In fact, ignoring the signs & behaviors, through pain and dominance methods, will make the problem worse, because pain increases stress and uncertainty. Separation anxiety can occur in a multitude of scenarios. Puppies and dogs are pack animals who are instinctively drawn to their mother and others in their pack. When puppies are taken from their mother or littermates, they can suffer from anxiety. Other scenarios that may trigger anxiety are when pet parents leave their puppies or dogs home alone to go to work, and some dogs struggle with anxiety from severe weather or loud celebrations such as thunderstorms or fireworks. How can you tell if your dog has separation anxiety? Look for body language, and your dog will give you warning signs that they are anxious. Happy dogs are relaxed with their mouths slightly opened – like they are smiling. Dogs that pace, have their tails down, ears back and pupils dilated, are anxious. They may begin to whine, bark and howl, exhibit destructive behaviors such as chewing, scratching, digging, and may even attempt to harm themselves, escape or run away. 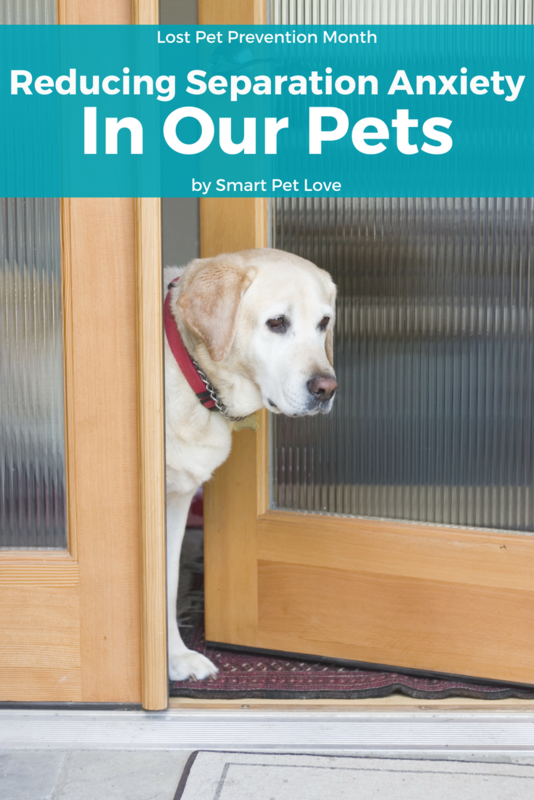 How can you help your dog improve their separation anxiety or prevent it from happening? Teach them to self-soothe. Toys that require mental stimultion and concentration are great for helping dogs stay busy. Things like toys that can be stuffed with treats or "games" for your pooch are also good tools. These methods keep them distracted and can help them forget their fears, or tune out the anxiety. Keep your departures quiet. Don't make a big deal about leaving the house. If your pet gets anxious when you leave, making it a spectacle will only make it worse. Give them a pat on the head, then calmly and quietly leave. This can help them realize that you leaving isn't a big thing. Give them something to entertain them. There are many great resources for dogs with anxiety these days. Some that can really help to distract or occupy them are visual & audio stimulation tools like DogTV, which provides many different types of visual & audio stimulation for dogs that are scientifically created. Give them plenty of exercise before you leave and again when you come home. Tiring out your pup is a great way to help their anxiety. Make sure they get adequate playtime with you before you leave so they are tired once they are alone. Then, when you come home, play with them some more to help expend the energy they built up while alone and also so they know that if you leave, it means you'll come home and play! Also consider introducing a comfort tool. One terrific comfort tool to try is a Snuggle Puppy that’s designed to instinctively relieve anxiety with the real-feel heartbeat and heat pack that slips into the pouch, mimicking a friend or littermate. By utilizing a combination of tactics, the result can be a calmer and much more peaceful pet and happier pet parent.